← How to convert PCL to bitmap and set page orientation? 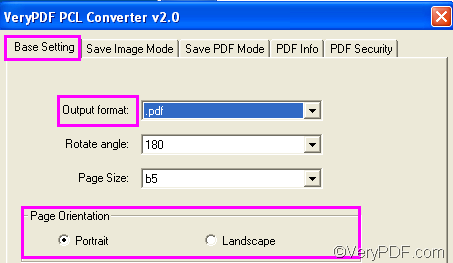 How to convert PXL to PDF and set page orientation? If you want to convert PXL to PDF and set page orientation, VeryPDF PCL Converter is one of the best choices. When you use VeryPDF PCL Converter to generate PDF files from PXL, you can choose to combine multiple PXL files to a PDF file, or convert separate PXL to separate PDF files. You can download VeryPDF PCL Converter by clicking here. After installing it on your computer, please do as follows to convert PXL to PDF and set page orientation. This article focuses on the GUI application contained in VeryPDF PCL Converter. You can run the GUI application by double clicking the icon on the desktop. You can first browse the PXL files and select the files you want to convert from Windows Explorer and then drag and drop them into the list box of the interface. All the selected PXL files will be shown in the list box. Click Setting on the interface, you can find the setting dialog box on your desktop. As the first combo box shows, the default output format is PDF. Hence, you don’t need to set output format. In the Page Orientation group box, the default page orientation is portrait. If you want to change it to landscape, you can click the radio button before Landscape. When you convert multiple documents to PDF, The computer will automatically generate one PDF file from the source files. If you want to convert multiple documents to multiple PDF files, please click the Save PDF Mode tab, and then click the second radio button in the Make PDF files mode group box. After setting all the options, don’t forget to click OK.
Click Start on the main interface. The Browse for Folder dialog box pops out immediately. You can select a folder as the export folder and then click OK to start the conversion. How to convert PRN to PDF and fit to paper size? How to convert PDF to multipage TIFF? This entry was posted in VeryPDF Blog and tagged pxl to pdf, set page orientation. Bookmark the permalink.